While the policy of (re)naming streets in New York City makes the life of people comfortable helping them to locate sites easier, the streets of Bishkek City confuses not only visitors, but also the erstwhile. For example, in Manhattan island of NYC, which I have been able to get familiar with as good as Bishkek in a relatively short time, the names are given in numbers - there are eight south-north connections named as avenues and about one hundred ninety east-west connections called as streets. When you walk up from the Financial District which is located in the South Manhattan towards Harlem district which is in the North of the City, the street numbers increase. When you walk from the office of Open Society Institute, located in the west Manhattan, towards the UN building in the East side of the City, the avenue numbers are decreased. This makes easier to finding locations you want, and make your orientation in the City pleasant for visitors. For example, I enjoyed exploring Manhattan since my very first days of staying here as a Visiting Scholar at New York University, which is located in the heart of Manhattan island - between the Financial district in the south and Time Squire in the north. The numeric naming of streets helped to save my time, making my life more comfortable, therefore I can say that New York is one of the most hospitable cities in the World. In contrast to NYC, Bishkek is a small town with ten times lesser population. However, it’s much harder to get easily acquainted with Bishkek for a visitor “thanks to” numerous confusing titles of streets, which are not numerical. According to a discussion in the Kyrgyz Parliament, the main street of Bishkek has changed its time at least five times since the foundation of the City. The given names are also not relevant to the local history and reality. 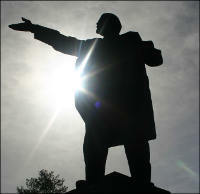 What does Moskovskaya, which is the name of one of the central streets of Bishkek, means to Bishkek citizens? The same can be said about Baitik baatir, Abdrahmanova, etc. These imposed titles may be important for some Kyrgyz tribes or regional elites, but doesn't give any comfort to visitors and ordinary citizens. Therefore, I propose the city administration to assign numbers to each street in Bishkek as they are in New York City. The streets connecting eastern and western parts of Bishkek might be named East-West + a number, i.e. EW 7, or ЧБ 7 in the Kyrgyz language. And the streets connecting the Northern and Southern parts of the city could be named as North-South + a number. Askarbek Mambetaliev, Visiting Scholar at New York University.